Back in the late 1960’s, the growing Olivetti Corporation acquired a 42-acre estate in Haslemere, Surrey, for a new UKtraining centre. The late 19th century’ manor house was refurbished to provide residence for students, with a contemporary designed atrium and new teaching wing added. The new building used fibreglass panels manufactured from Scott Bader’s Crystic® resin and gelcoat. 43 years on the Lloyds approved marine grade Crystic 65PA gelcoat, also suitable for exterior building applications, is still in very good shape and has proved its long term outdoor performance capabilities. Olivetti in the late 60’s had world leading product designs, likened in the industrial design world at the time to the way ‘Apple’ is regarded today. So, it was not surprising that Olivetti commissioned James Stirling, the internationally celebrated architect of his time, to create a modern building with a unique design for their new UKtraining centre. Stirling’s designs were often radical, incorporating vivid colours and using new types of building materials. This included the use of glass reinforced plastic (GRP) exterior panels as they enabled Stirlingto design interesting new shapes for the façade of a building; this holds true for architects today. Sir James Stirling (1926-1992) is now regarded as one of the most significant British architects of the 20th century. 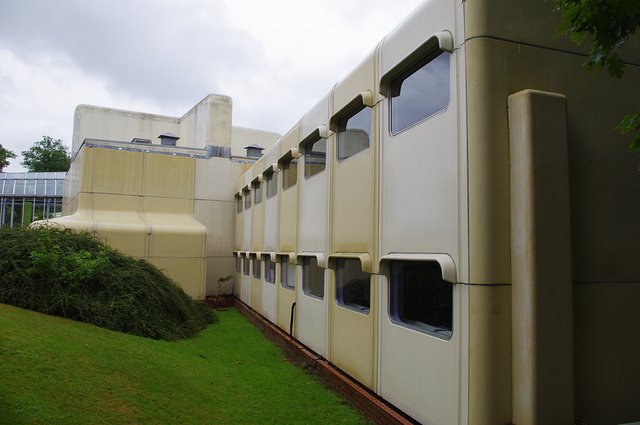 The new Olivetti training centre was completed in 1969 and in 1977 the building was given a Grade II* listing by English Heritage. The GRP polyester panels, which form the outer structure of the building, were fabricated at the time by hand lay-up using Scott Bader’s Crystic unsaturated polyester resin and 65PA brush applied gelcoat. When the new training wing was built, the roof panels installed were gelcoated in beige and cream colours. However, the researchers who put together the 2011 Tate Britain architecture exhibition featuring Sir James Stirling and his work, discovered drawings that showed he originally intended the GRP panels to be lime green and violet. Crystic products were chosen at that time as the market leading GRP technology in the UK, which is still the case today. For over 50 years, Scott Bader has remained a leading innovator in composite materials, such as the recent development of their Crestapol urethane acrylate high performance resins, and Crystic Permabright®, their next generation advanced D-Iso/NPG gelcoat technology, developed for demanding marine, transportation and building applications.